We were always happy to have Fresno host the Annual Statewide Festival, partly because of its easy access from both the North and South. Besides, facilities for dancing were excellent and there was plenty of good housing. The weather around Memorial day was sometimes quite warm so the dates for the Festival were moved up to May 4, 5, and 6, for the 11th anniversary. Most of us were able to reach Fresno in time for the Opening Party Friday night, May 4th. Fresno Municipal Auditorium is an excellent place to hold a Statewide and Chairperson, Marjorie Widman, and her Committee had a full three-day weekend planned. Though advertised as the Opening Party, they scheduled seven sets of exhibitions for opening night and all were exciting. The Institute on Saturday afternoon featured two teachers from the South and two from the North with Vyts Beliajus as an added attraction. Buzz Glass taucht "La Chilena," a Mexican dance he brought with him from his year spent at the University of Mexico. Al Pill, another authority on Mexican dance and the possessor of what seemed an inexhaustible supply of Mexican hats, introduced "Amor de Madre." The Saturday evening Festival was not only well attended but most dancers were in full costume. In the lobby, the Food Merchants were displaying their tempting food delicacies, featuring many international varieties. Twice during the evening we were entertained with excellent exhibitions. There was a pause in the program to introduce Marjorie Widman and her Committee as well as the two Presidents, Bev Wilder of the North and Minnie Anstine of the South. For the first time at any Statewide, there was an After Party scheduled at the Fresno Hotel. A small group of us, some from the North and some from the South, decided to skip the After Party and to assemble in one of the rooms for a little relaxation and conversation. Some refreshments seemed in order. There was a refreshment counter in the Auditorium, selling soft drinks and beer. We ordered a few bottles of beer to take with us but to our surprise, they insisted removing the caps as they did not have and off-site sale license. This left us with several bottles of uncapped beer. Being resourceful, we moved over to the Coke machine, inserted our coins, then removed the caps from the Coke bottles. The caps from the Coke bottles were then placed on the beer bottles, and the Coke found its way down the drain. After all this trouble, the delay encountered caused the party to break up and I don't know what became of the recapped beer! The Evaluation Breakfast was held Sunday morning in the Fresno Hotel after which there was a North-South Relations Committee Meeting. The Sunday afternoon party at the Auditorium started at 1:30 p.m. Again, the international Food Merchants were on hand for our pleasure. Some folks appeared to be taking their meals here at the Auditorium rather than in the restaurants downtown. There was a large crowd Sunday afternoon at the Festival although as the day wore on, more and more peoople started for their rather long drive home. For those who could afford to stay over, there was a post-Festival Dinner and Dance Party planned at the Knights of Columbus Hall. While most of us from out of town were unable to attend, for those who did we are sure it was a gala affair. 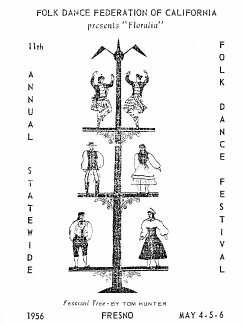 And so ended the Eleventh Annual Statewide Folk Dance Festival and a most enjoyable one, as could be expected. 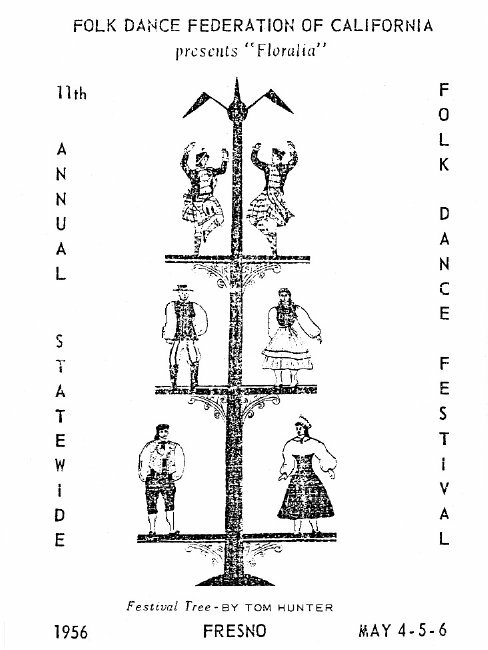 The Festival Tree on the cover of the program was designed by Tom Hunter.